I love KerryGold Butter. The difference in flavor is remarkable compared to the standard brand and I love to use it for special recipes. However, my first love from the Kerrygold brand is their Dubliner Cheese. Dubliner is a sweet mature cheese (aged over twelve months) manufactured by Carbery and marketed internationally under the Kerrygold brand name. Though named after the city of Dublin it is made in County Cork. It combines the sharpness of mature cheddar, the nuttiness of Swiss cheese, and the bite of Parmesan and I’ve been determined to make a macaroni and cheese using it for some time. I tried a bit ago and failed. Really. A couple of weeks ago I mixed Dubliner with some ricotta and white cheddar and made a nice sauce for the bowtie noodles I was using. My mistake though was in deciding to bake it. I put some bread crumbs mixed with some parmesan on top and it just would not brown. Though it looked fine, that time in the oven did nothing to improve the flavor, as a matter of fact, I didn’t like the compactness of the end result and wished I had just served it up from the stovetop. So tonight it was time for a second attempt. I actually loved the ricotta with that last batch yet I thought it sort of diluted what I love about Dubliner; that nutty Swissy Parmesany flavor. So tonight it was Kerrygold alone but with some additional ingredients to kick it up a notch (Emeril, can you hear me?). I thought caramelized onions, rosemary and some white wine would do the trick. I have to be honest…I used a bit more wine than the recipe I’ve published but there were no kidlets here for this meal. It was a totally adult flavor…so substitute some of the chicken stock with more wine if you’re game…of if you want no alcohol, do the opposite and use all stock. And try not to eat it all in one sitting. 1 pound pasta - tube shaped - I used Campanelle which is really short of horn shaped and a bit more delicate. But so doggone cute! Melt 2 Tbsp of butter and olive oil in large skillet. Add sliced onions and cook over low heat for 20 minutes until starting to brown. Add 1/8 cup of white wine and continue to cook for 5 minutes. Add another 1/8 cup of wine and cook until just brown, 30-35 min. Add 2 Tbsp balsamic vinegar and cook for two more minutes. Set aside. Boil water and cook pasta according to package directions. I under cook by a minute since I know it's going in the oven. While pasta is cooking, melt 2 Tbsp butter in small skillet, add panko crumbs and cook on med low heat until browned. Set aside. When pasta is finished cooking, drain and melt remaining 4 Tbsp butter in same saucepan. Cook until butter just starts to brown. Lower heat, add rosemary and saute for 2 minutes. Add milk, broth and remaining 1/4 wine and whisk smooth until thick. Add dry mustard and season with salt and pepper to taste. Add 1 cup of cheese to pan and cook on low heat, whisking firmly til sauce is smooth. Put macaroni and sauce in large pan with onions and mix well. Scatter remaining 1/2 cup cheese on top. Bake just to warm; 10-15 minutes. Serve and spoon toasted breadcrumbs on top. Photo of Dubliner Cheese courtesy of Kerrygold website. Visit the Kerrygold website for more recipes. Boil the macaroni in a 2 quart saucepan in plenty of water until tender, about 7 minutes. Drain. In a medium saucepan, mix butter and cheese. Stir until the cheese melts. In a slow cooker, combine cheese/butter mixture and sour cream, soup, salt, milk, mustard and pepper and stir well. Then add drained macaroni and stir again. Set the slow cooker on low setting and cook for 3 hours, stirring occasionally. **you can add three eggs to this and combine them in when you add the sour cream, but I do not like how the eggs seems to congeal the pasta when cooking. I had some Dubliner that I had not used…and wanted mac and cheese so did a search and came up with your recipe. It is delicious (taste as you go) and I have not put it into the oven yet! I did add more chicken broth as I cooked the mac just al dente. I am having company for Sunday dinner so I am sure we will all love this as a delicious side dish. Joan, I especially love your taking the time to comment after making this dish; it means a lot to me to know that others enjoy the recipes I put online. The Dubliner is perfect isn’t it? I have discovered that a 50/50 (approx.) mix of Dubliner and Ballyshannon cheeses makes an incredibly smooth and tasty all-purpose cheese sauce that is perfect for a mac and cheese. I also use it over fresh steamed broccoli or on baked potatoes. I start with a white sauce and add a bit of each cheese until it is the right cheesiness. Delicious! I will have to try your recipe but will probably use a mix of Dubliner and Ballyshannon as I have blocks of each in my fridge that need to be used up (that’s how I discovered your recipe – searching for supper ideas using Dubliner cheese). I’ve not had the Ballyshannon cheese Alan but if it’s half as good as Dubliner, well, I know I would love it. My next big mac and cheese thing? I want to try making it and cooking it in my smoker! I probably WOULD eat this all in one seating. 🙂 Your version is “very grown-up,” and I love ALL of the ingredients in your second attempt. I’d go + on the wine, too. Beautiful presentation! This looks so darn good, Barb! 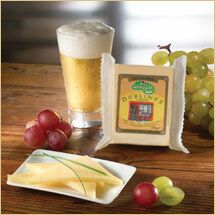 I love Dubliner…it’s my favorite Kerrygold cheese. Makes a good really cheese sauce paired with fettuccine too. I just posted my own Kerrygold macaroni and cheese before I happened upon yours. Love the additional herbs and the bread crumb crunch here. I’ll have to make this to use up some of the Dubliner I have in the fridge. Gorgeous! Thank you Shaina…it sure does make a good mac and cheese doesn’t it. I’ll go check yours out too. This looks absolutely delicious. I haven’t tried Kerry Dubliner but between your description and some of the comments, I’ll have to pick up some! It’s a great cheese Ben, one of my favorites. I use it for sandwiches too and shave it like Parmesan…a multi purpose cheese it is! Wow, that looks fantastic! Anything with that much butter is making this southerner swoon. Loving the photo too! Thanks Mary…and making a southerner swoon at mac and cheese the height of a compliment! Amazing! Love the addition of the onions. I’ve seen Kerrygold butter at the store and have wondered what all the fuss is about. I’ll have to give it a try. The fuss is worth is; for both the butter and the cheese. Try it, you’ll like it. My mac and cheese loving heart is full at this moment. You know…you got me started a few weeks ago. Thank you. Glad to be able to provide some inspiration. I can get Dubliner cheese, though, and I’m ashamed to admit that it never occurred to me to use it for mac n’ cheese (though, in retrospect, it’s a pretty obvious choice). 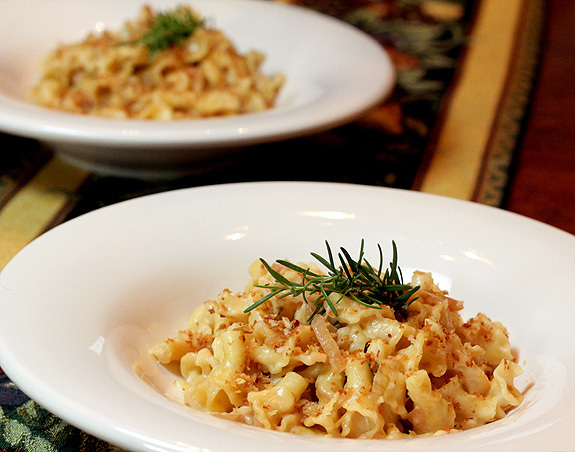 Love this sophisticated grownup version, too… I mean, what’s not to love about mac n’ cheese made with WINE. Ouch…sorry and there really isn’t another cheese I can recommend to get the same results…but if I were desperate, I would probably do a combination of white cheddar and parmesan. WOWOWOWOWOW!!!! I just died and went to cheesy, buttery macaroni heaven!!!!! p.s. – have you tried making cookies with KerryGold butter yet? Outrageous. OH MY WORD!! I am drooling this morning over this recipe. Kerry Dubliner is my absoulte favorite cheese. Now to hide my rumbling tummy from everyone at work. Shhh…I’m not here looking at yummy food, nope not at all. Looks amazing! I sampled some of the Dubliner cheese at Costco earlier this month, and you do an excellent job of describing the flavor profile. And seriously… Anything with wine and caramelized onions? I’m sold.